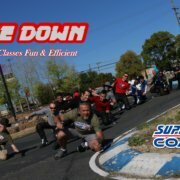 It was another, highly dynamic Knee Down class last Saturday! We’ve worked our butts off to make our students dreams finally come true. We didn’t achieve the same success rate of 18/21 this time, but 16/21 ain’t bad at all since there were even some riders who are actually haven’t been for long on bikes before. We’re not just aiming for that particular goal only. Superbike-Coach knee down classes are a darn challenge, because we also go for entry, mid and exit corner speed and fix body positioning issues ON THE RUN. Means- even those 5 who ain’t got the damn knee down are going home with a whole lotta sack of knowledge and training. I so loved everyone’s eager. Nobody gave up on themselves and I can’t be more proud for my crew Marion, Ben and Dean Lonskey, who took this fun shot of us which illustrates what kind of caliber our classes are… fun and efficient.